But the sangria still rocked! This happened to be the one day of the summer that I somehow didn’t have fresh berries in the fridge. So ended up just going with oranges, lemons and limes…and it was great!! Since I ended up making a double-batch for the size of our group, I actually combined a bottle of Merlot with some boxed wine we had leftover from a wedding. But hey — that’s the joy of sangria! With all of the other yummy flavors in there, you don’t need a really expensive bottle of wine to make good sangria. Anyway, this batch ended up being a stellar success. My friends all gave it rave reviews — even without the addition of sugar. I tend to find that the longer you let it sit in the fridge, the less sweetener you need and (of course!) the more fruity the flavor. Yum. 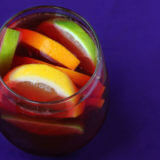 You will love this fresh, simple, and oh-so-flavorful Red Sangria recipe! 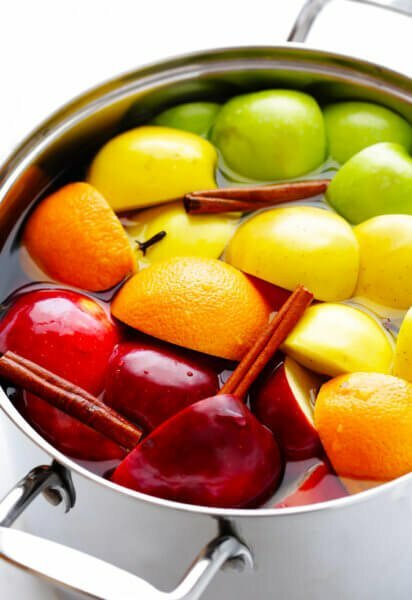 Stir together the wine, orange juice, sugar, and brandy in a large pitcher until the sugar is dissolved. Then add in the orange, lemon and lime slices and stir briefly to combine. Refrigerate the pitcher and let it sit, preferably 8-12 hours for the juices to meld. Just before serving, stir in the gingerale (or club soda, or lemon-lime soda) until mixed. 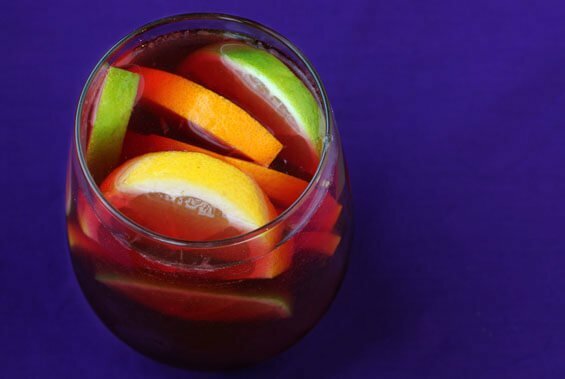 Then serve the sangria poured over ice, either strained or served with the fruit slices. Fresh berries (or even frozen) are also a wonderful addition to red sangria! Just be careful (at the recommendation of my friend, Lisa) not to add sliced strawberries in more than a few hours beforehand, as they can turn soggy and watery. Oh, goodness — there’s nothing better than a carafe of sangria on a hot summer day. And I love when it ends up being is the refreshing, boozy equivalent of an icebox dinner! I couldn’t agree more! :) The perfect fresh drink for summer! I love sangria! I like to keep it in the fridge for about a week, it gets all of the fruit flavour! So good. OMG I love Sangria! This looks awesome! I love red sangria, but haven’t tried to make it myself. 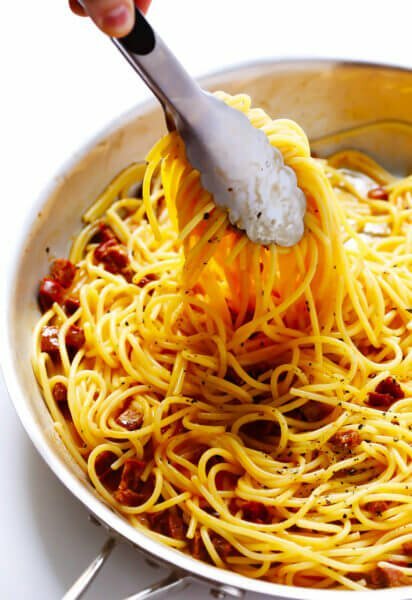 You’re recipe is getting bookmarked right now. Thanks. I speak as one of those happy houseguests – it was great! Can’t wait for sushi night to try out the newest recipes! 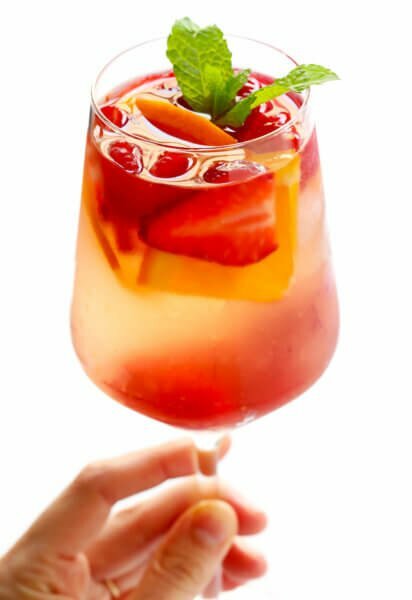 I love Sangria, a great summer drink. The best red sangria in KC is at Spin! Pizza of all places. They use sugar-coated frozen grapes as ice cubes. Yum! I put a drained can of pineapple chunks, a bag of frozen raspberries and about 6-8 sliced strawberries in my sangria. I also slice a lemon, lime, and an orange. Then I put in 1/4 c. triple sec, 3/4 c. brandy and 3/4 c. peach schnapps. So tasty after a few days in the fridge.